Congratulations to Dr. Juan Jaimes who now holds the world record in diagnostic accuracy, as achieved in the DermaChallenge event hosted by the Dermatology Department at the Medical University of Vienna. During the human versus human part of the event, the over 1,000 participants from 65 countries viewed a number of photographs from a pool of nearly 10,000 images showing dermatological conditions including skin cancers, lesions and more. The primary challenge was to get 30 images correct. 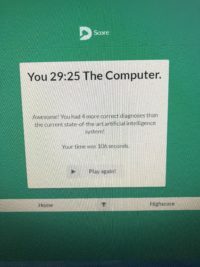 Participants made over 2500 attempts and Dr. Jaimes was the first and only participant to achieve a perfect score of 30/30 and declared the winner. One of the skin cancers Dr. Jaimes excelled at diagnosing was melanoma. Melanoma can be one of the more dangerous types of skin cancer, but the earlier it’s detected the easier it is to treat, and the higher the survival rate. Dr. Jaimes has been with Dermatology Consultants since 2011. Request an appointment with Dr. Jaimes conveniently online. Skin Cancer Diagnosis, Types and Treatment Options In "Dermatology Consultants Skin Cancer Center Blog"
Five Dermatology Consultants Physicians Named to 2017 Top Doctors – Rising Stars In "News"